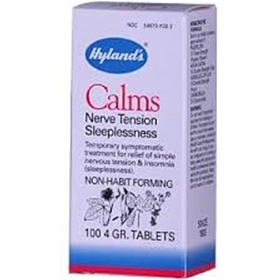 Hyland's Calms is a homeopathic remedy for the relief of simple nervous tension, stress, insomnia, and sleeplessness. It is safe and non-habit forming, with no side effects. Homeopathy is a natural, holistic, approach to healing a person, using minute doses of specific remedies, rather than simply eliminating a particular symptom using a Band-Aid approach. The model for homeopathy is one of individualization, as no 2 people are alike. It takes an holistic approach to healing, involving the body, mind, emotions, and spirit of those being treated. There are many studies proving the effectiveness of this non-invasive, safe approach to healing. Homeopathic Medicines are regulated as drugs by the FDA and their manufacturing facilities are inspected by the FDA.